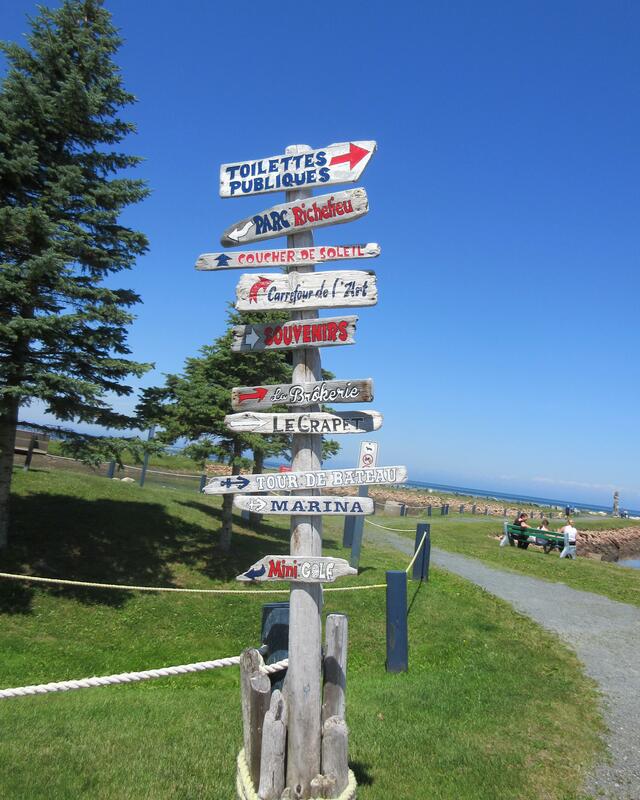 Umm, how do we get to New Brunswick….anybody? 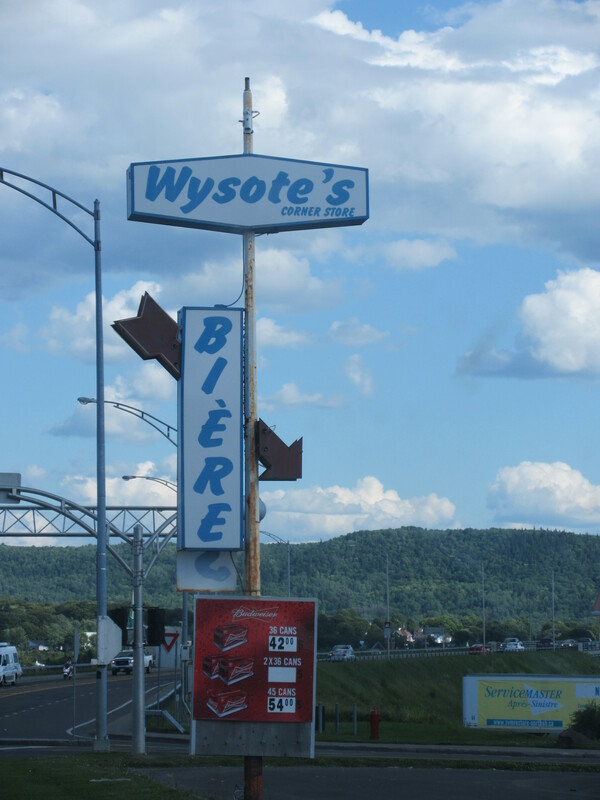 I gotta confess, I’m glad to leave Quebec and head into New Brunswick. 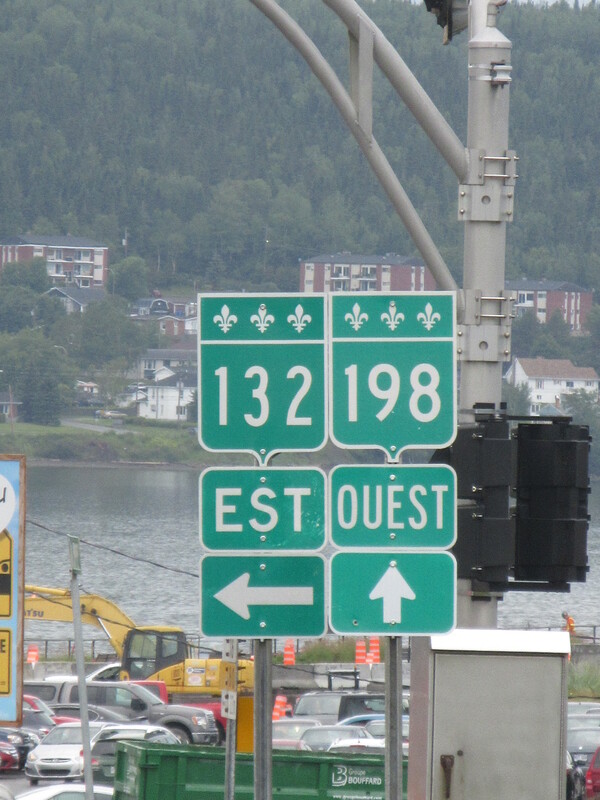 Don’t get me wrong, Quebec is a beautiful, culturally rich province with great historical significance. Okay, that’s the good stuff; the bad stuff is that it’s also in many cases really, really ethnocentric. Trois Rivieres, is a prime example. All historical sites, of which there are many, have lengthy placards with descriptions of the historical significance. We would have loved to know what the significance was, but there was none of that namby-pamby French/English translation stuff. It feels like a big middle finger to any non-francophones who might visit. Where’s the love Quebec? 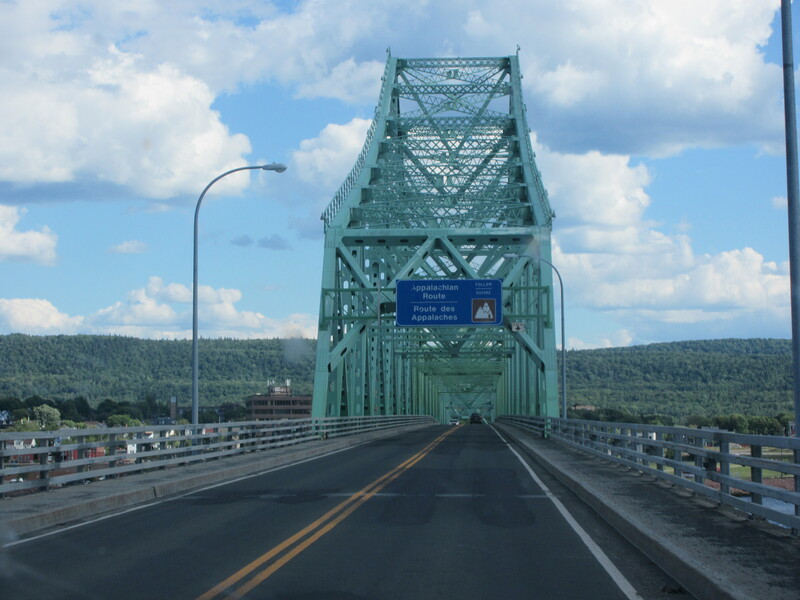 Even our exit from Quebec over the bridge to Campbellton N.B. feels like we’re leaving another country. 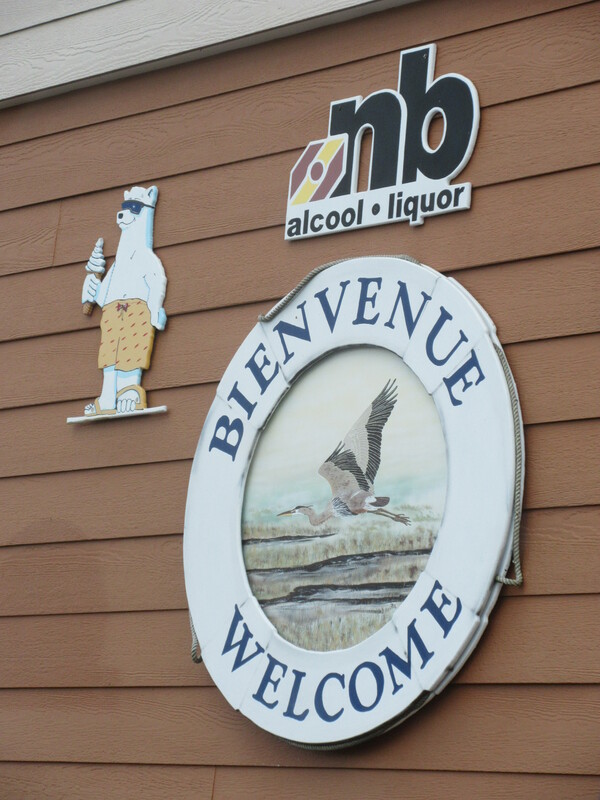 The Quebec side, Pointe-à-la-Croix, has duty free stores selling 60 packs of beer for a relatively cheap price and a “cheap smokes” hut fronts the entrance to the bridge. Okay, on to New Brunswick. Truth be told, I know little about the province, other than it is in the east, New Brunswickers I’ve met are lovely folks, and its coastline encompasses one side of the world famous Bay of Fundy, which operates like the ocean’s washing machine, twice a day. 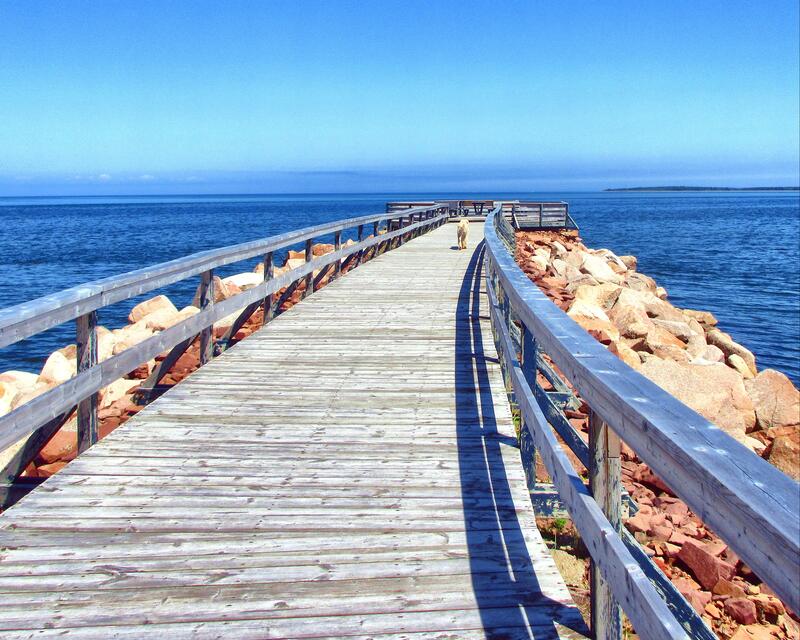 Northeast New Brunswick, is Acadian country. A soccer team you say? Perhaps a secret society devoted to the preservation of wooden accordions? No, they are in fact French speakers descended from the original French settlers in Canada, many of whom have French and Metis blood. If you go down to Louisiana you will find more Acadians, called Cajuns, with their strange mix of pigeon French. 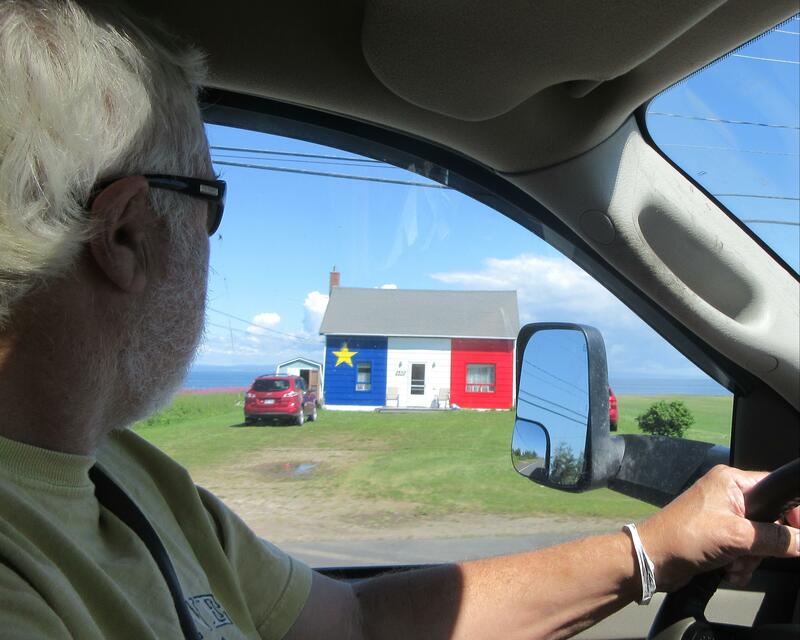 Acadians aren’t like Quebecers in that they have their own flag, culture and a much better sense of humour. 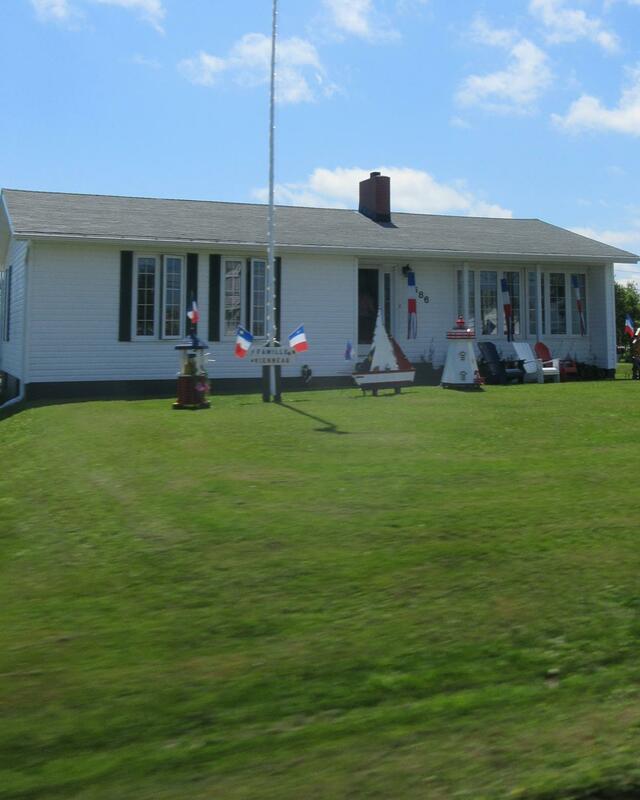 They are fiercely patriotic to their Acadian heritage. As we head down the Atlantic coastline we notice the flags, blue and white with a yellow and red star in the top left corner. The image abounds. The flags are often complemented by red, white and blue coloured barrels, garden planters, chairs. The Americans flag-fliers have nothing on these guys. We are aiming for Bathurst for no reason other than we’ve heard the name before and believe it will have a movie theatre. We’ve got a hankering for a night in a darkened room with sticky floors and a tub of over-priced greasy popcorn. It gives The Dude an opportunity to vent about the lack of quality films, price of said popcorn and the virtues of Robert DeNiro, an acting god in The Dudes’ opinion. Given her opening, the Dame explains the concept of escapism, profit margins and why DeNiro hasn’t done anything worthwhile in years. All-in-all, an exhilarating and air-clearing night out. Sometimes your intended destination doesn’t cut it, sometimes the open road feels more appealing than the stop. 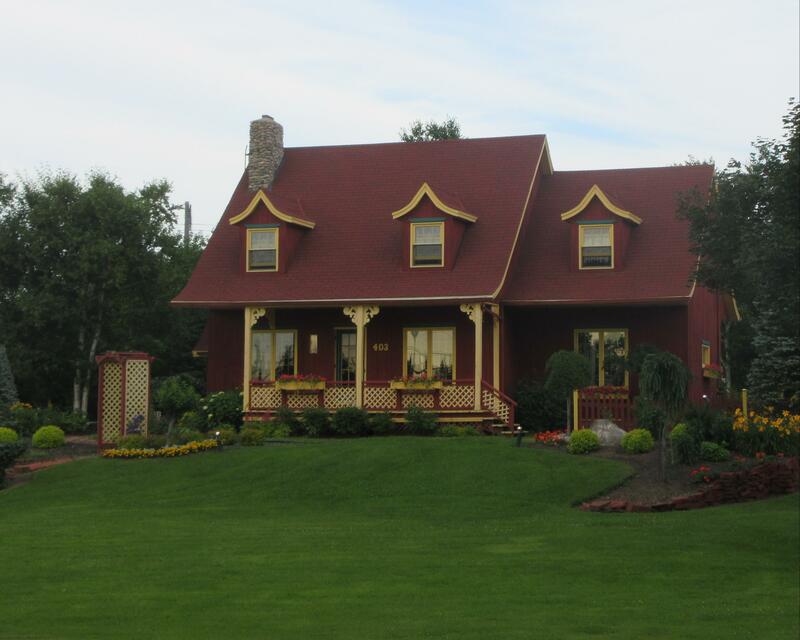 We move on past Bathhurst, heading south and end up in Beresford, N.B., a one-stop fantasy fun-land RV Park with a massive waterslide and a kabillion munchkins running amuck. In other words hell on earth. But, hey, it’s a happening place. The bingo game is in full swing when we arrive. We resist the temptation to grab a dauber and dive in and instead settle for a plate of Poutine pour moi (Oh, yah baby!) and the traditional hamburger/French fry combo for The Dude. These last-minute, one-night stops play havoc with the good intentions of eating right. Damn you, plate of deep fried potato, gravy and cheese goodness. 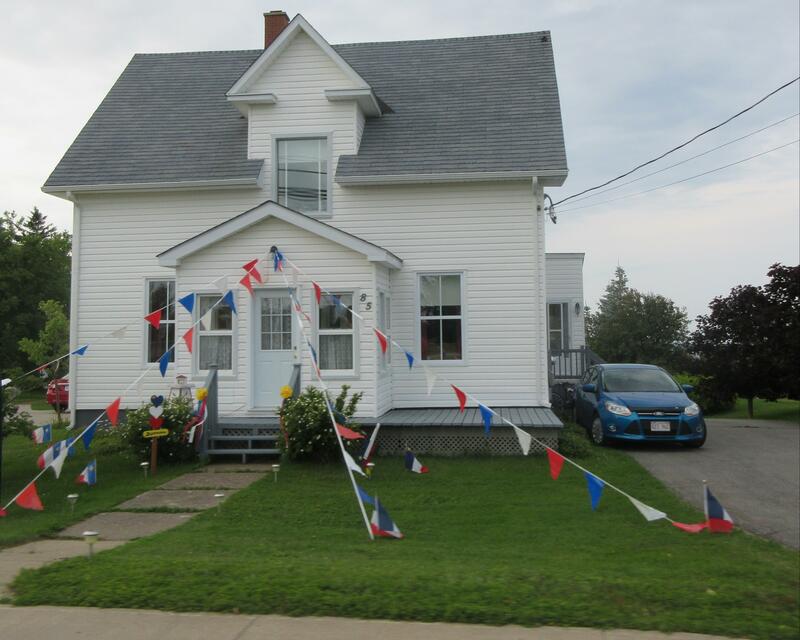 With the bingo and fried food stop over, the road takes us down the Acadian trail, and winds along the Atlantic coastline past clapboard houses with multiple additions tacked on to the original two-story structure. They’re like Lego houses, here’s an empty wall, let’s add a room for Grandma. Some are so adorable with their tidy gardens, yard adornments and well-kept lawns it makes the viewer yearn for simpler times. A brisk business in miniature windmills, lighthouses and wagon wheels is being done in New Brunswick, I sense a franchise opportunity. What’s the difference between a tree house and a twee house? Okay, wishing well, check. Sailboat, check. Miniature lighthouse, check. 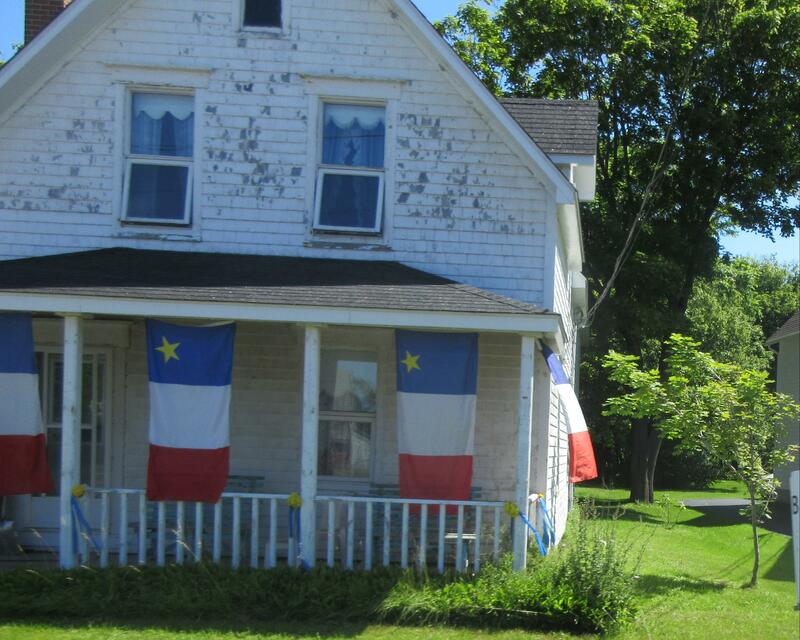 Acadian flags, check. A tree house is most often basic, little more than a rectangle in a tree. A twee house is never basic. It has gingerbread and curlicue trim below the eaves, colourful shutters and window treatments, bright paint in primary colours with a contrasting roof and door and immaculate front verandas with chairs places just so. A tree house is in the backyard. A twee house may have a treehouse in the backyard, along with the aforementioned miniature windmills, lighthouses and wishing wells. A treehouse relies on natural leaves and branches for its charm while a twee house is dependent on its riding lawn mower to keep the grass clipped to the standard of a Home and Garden cover. Let’s hear it for the Acadians, Canada’s original twee huggers. Itâs my own cruel Whereâs Waldo especially for you, find the word, guess if the word is real or a product of my over-active imagination. Your blogs are the best bit of “escapism” one could ask for.